The earthquake affected areas are still in the recovery stage. Even before the disaster there were problems; poverty, younger people leaving the area so there was a lack of people to look after the ageing population. After the disaster there were problems caused by radiation. Experts and NPO groups have been working together to solve these issues. JEN asks “What can JEN do to support the policy of “no-one left behind” and “What must JEN do to help the community recover?” JEN’s work has shifted from raising awareness and direct community support to supporting local organisations through partnership working. Listed below are seven projects initiated by the partner organisations (local specialists and NPOs) of JEN in Iwate, Miyagi and Fukushima. Also, JEN has undertaken three responsibilities below and we will contribute to rebuilding “no-one left behind” society in the disaster stricken areas. Midwives in Japan are appointed by the Minister of Health, Labour and Welfare. They give advice throughout the pregnancy, assist at the delivery and after the delivery continue to offer their consultancy services to ensure the baby is well cared for and that good relationships are developed between the babies and parents and other family members. Since the earthquake, the Fukushima Midwives Association has visited evacuation centres and run short stay programmes for mothers and babies in midwife centres. (1) Running seminars about pregnancy – to offer advice, reassurance and information on how to access different resources i.e. maternity and medical centres. (2) Visiting schools to build the pupil’s self- esteem and confidence promoting the idea that every child is precious. (3) Baby care sessions – creating opportunities for mothers to meet midwives and also to meet other mothers so they can develop a support network and not feel so isolated. (4) Nutrition workshops – giving advice on cooking food for infants. More than 600 people died in Miyako City as a result of the Great East Japan Earthquake. 9008 buildings were damaged or destroyed. Miyako City is one of the largest cities on the coast in Iwate Prefecture. Over the last 50 years, the population has been decreasing and getting older with younger people moving away. Social services along with the social welfare plan needs to change to fully support the remaining members of the community. Kurashi Net, a part of Miyako City Council of Social Welfare, has been supporting the local community by running “SHIOKAZE-Kitchen” where social workers and volunteers meet local people of all ages once a month. With the support of JEN Inclu Iwate visited and studied the “Children’s Dining Hall” in various places. It was then able to run training sessions for the staff who would manage the “Children’s Dining Hall” in Miyako city, which primarily targets single parent households. Rikuzen-takata city of Iwate prefecture suffered tremendous damage from the Great East Japan Earthquake. After the earthquake, many people were forced to leave the area due to the prolonged evacuation and lack of jobs. The city’s population has decreased by nearly 20% since the earthquake. JEN has partnered with the SAVE TAKATA, a foundation that revolves around agriculture, IT business, and youth business in Rikuzen-takata city to support the creation of a community for the younger generation. In the 2016 version of the World Economic Forum’s Global Gender Gap Report gender inequalities are quantified around the globe, Japan was ranked 111th out of the 144 countries surveyed. Work inequalities and low representation of women in politics were especially highlighted. In the affected areas of the Great East Japan Earthquake, there are many young women in their 20s and 30s that wish to “improve their region,” and work in NGOs or social businesses. However, because they are “young” and “female,” it is not easy for them to voice their opinions and to take part in decision-making. Women’s Eye, an organization based on the mission that “Women can empower themselves and succeed” has implemented “Grassroots Academy Tohoku” since the Third World Conference on Disaster Reduction was held in March of 2015. Grassroots Academy Tohoku is a place in which the next generation of female leaders from the three prefectures of Tohoku (Miyagi, Iwate, Fukushima) gather to learn from others, share their experiences, contribute and grow. JEN has partnered with Women’s Eye since 2016, to support the Grassroots Academy (2-3 times a year) in Japan both financially and by providing expertise. In the afflicted area, houses that were once lived in by three generations were lost due to the earthquake. Families had to split up and live in different temporary housing or the younger generation moved out. So now there are an increasing number of cases in which an older husband or wife has to take care of their significant other. In Ishinomaki City of Miyagi Prefecture, volunteer nurses and medical experts have noticed that at home male carers are suddenly having to do the cooking and housework and have no one to turn to for advice. Therefore, “Male Caretakers Classes” have been held since 2014. JEN has partnered with the “Male Caretakers Class” to support further enhancement of the program. A regional population includes all types of people; from small children to older citizens, people with differing disabilities, illnesses, and native languages. Involving diverse participants in disaster risk reduction, to make them well prepared for emergencies is the way to build a resilient community. 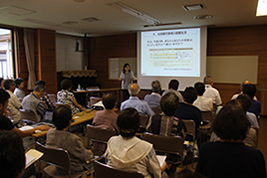 Following the Great East Japan Earthquake, the Gender Equality Center in Tohoku took the initiative to run training sessions on gender equality and disaster. Participants included staff of municipalities and fire departments, as well as local community leaders. As a result of the initiative, understanding of the importance of both genders taking equal roles in disaster risk reduction has been gradually increasing. To accelerate this and for gender-equal perspectives to take root in the region, the Training Center for Gender & Disaster Risk Reduction (GDRR), has　been using its vast know how and experience to educate local organizations and individuals. JEN partners with GDRR and supports its activities. © JEN All Rights Reserved.